Over the past six years, Sofos developed and delivered numerous training programs for teachers on working with Moodle, the free and open source Virtual Learning Environment. Various formats have been used, the most favourite one for our clients being the 2-day training program. The latter requires a limited time investment from the teachers and gives them a rich learning experience: a good overview of the whole Moodle system combined with hands-on experiences shared with their colleagues. The range of training activities developed around Moodle starts with a 1½ hour presentation for teachers, education management and/or ict professionals and ends with a 2-week training program during which the teachers develop their own online course. In between is a one day workshop for teachers and a 2 day training program for teachers. Sofos also offers a 1½ hour introduction to students, a 2-day training program for Moodle administrators and custom-made programs where appropriate. The 1 ½ hour presentation for teachers etc. is nice as a first introduction. 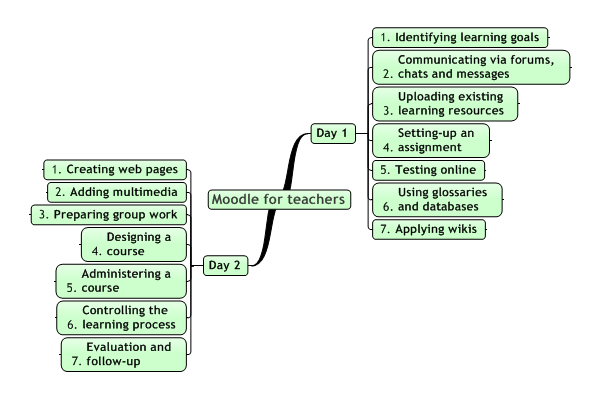 The 1-day workshop really gives an overview and raises teachers interest in working with Moodle. For some of them this is enough to find their own way. Others, however, might experience a kind of writer’s block when they really try to start working with the system. The 2-weeks training program offers the most tactile results as the participants work all the time on creating their own online course in a top-down manner. On the other hand, it is heavy for them as well. It requires a way of thinking and working that might be new and exhausting, while completely setting aside their regular work for two weeks is not always possible. The compromise appreciated most by our clients is the 2-day training program “Moodle for teachers”. The 2-day training “Moodle for teachers” is intended for teachers who want to develop online courses with Moodle, for those who want to deliver this type of courses and for all supporting staff. It is also highly recommended as an initial course for Moodle administrators. Prior Moodle experience is welcome, but not necessary. The 2-day training program is about a range of topics from simple (e.g. distributing handouts) to more complex ones (e.g. online collaborative work). In parallel, the course gradually shifts its perspective from working with Moodle as perceived by students, via Moodle course delivery as perceived by the teachers until Moodle course development. Topics for the first day are: communicating via forums, chats and messages, uploading existing learning resources, working with assignments, online testing, working with glossaries and databases and using wikis. On the second day, the topics are: creating pages including multimedia, working with groups, designing courses systematically, administering courses and regulating learning processes. The training takes place in a computer room. Training materials and hands-on activities are offered via Moodle (of course). In a special “Playground” Moodle course, all participants have teacher permissions and can edit their own course section, while being able to see the results of their colleague’s efforts. It is very stimulating to see how fast an empty playground course can be filled by the participants. Preferably, the participants should start working on their own Moodle course immediately after finishing the training program. It is also important to stay in touch with each other for mutual help. The Moodle course used for the training program is enrollable and downloadable via the Moodle Community Hub. The handouts are available via Slideshare. At the moment, only the Dutch (NL) edition is available. The course is based on Moodle 1.0; in 2011 it will be updated to Moodle 2.0. The 2-day training program “Moodle for teachers” has been developed by Pieter van der Hijden (Sofos Consultancy) and Ton Wolf (IOL, Suriname), both organizations are partners in ECOIS, the Centre of Expertise for Education and ICT Suriname. The course materials are licensed under a Creative Commons Attribution 3.0 United States License.